From Tunisia to Syria, the year 2011 has brought to light the potential of social media as a tool for positive change, as well as the ways in which governments and other actors are able to harness such tools for oppression. Though Palestinians have a rich online history spanning more than a decade, recent increases in Internet access–particularly in the West Bank–expose an entirely new set of individuals to the Internet’s potential. I was fortunate enough to attend the conference (December 4-6, 2011). 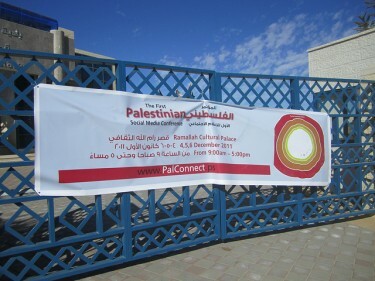 Sponsored by the US Consulate*, the Representative Office of the Republic of Germany in Ramallah, Al Jazeera, Deutsche Welle, SoukTel and UNESCO, among others, PalConnect was held at the Ramallah Cultural Palace, and live-streamed on the conference website, including to a group of participants gathered in Gaza. The conference featured a fascinating, if somewhat narrow, cast of speakers, a mix of foreigners and Palestinians with an expansive focus on social media. Though the theme was broad, it became immediately apparent that a primary interest of both speakers and participants was the use of social media to tell Palestinian stories. The first day of the conference was likely also the best attended, with nearly three hundred individuals filling the auditorium by the end of the day. The talks (many of which I missed, as I arrived late) were focused in the first part of the day on education, and in the latter on governance, but the real highlight of the day were the short films shown by Leaders Organization, a Ramallah-based organization. The day was not without disappointment as well: In the afternoon, participants were informed that the group in Gaza, gathered together to watch the conference live-stream, had been disbanded by police. Day 2 had a focus on journalism, with morning talks from the LA Times’ Robert Lopez and Al Jazeera’s Boutaina Azzabi. Lopez discussed the use of social media to report on protests, highlighting his own experience in covering the Occupy LA protests using tools such as FourSquare and Twitter. Azzabi spoke primarily about Al Jazeera’s methods of covering protests, including the use of citizen content and methods of vetting it, and concluded her talk by asking: “We need the Palestinians to tell their own stories but we are there to help – what do you need from Al Jazeera?” In the afternoon, speakers Katrin Verclas (of MobileActive) and Uqba Odeh gave talks on the use of mobile technology–relevant in that Palestine’s mobile penetration rate is estimated to be 97.5%–with focus on social change and bridging communities, respectively. The third and final day of PalConnect saw more of a focus on activism. My own talk on the innovative history of digital activism in the Arab world (slides available here) opened the day, followed by an extremely complementary talk by Palestinian researcher Majd Beltaji, who provided a slew of statistics and anecdotes from across the Arab world to illustrate the use of social media in this year’s revolutionary uprisings. The afternoon was the highlight of the day, with a panel of speakers who had been brought in from Gaza (I’m afraid I don’t have their names, as the agenda was shifted at the last moment). The panelists discussed the various challenges faced by bloggers in Gaza, with one female speaker noting that many women bloggers in Gaza avoid the use of their real names and photos, considering it too risky. The panel of bloggers did agree that blogging has allowed greater connection between online communities in Gaza and the West Bank divided by geography and occupation. Later in the day, I joined a panel with Dawood Hammoudeh of the Stop the Wall campaign and German blogger/journalist Christoph Sydow to discuss online safety; we received a slew of questions, many of which focused on Facebook’s safety and privacy record, and advised participants to take basic online safety measures (note: I also came equipped with loads of materials in Arabic, thanks to my organization, EFF, as well as Access and Movements.org). There were also complaints and—from what I heard secondhand—refusals to attend on the basis of US government funding. That said, as someone who is largely critical of US government funding for programs like this, I personally felt that the Consulate’s presence was fairly minimal; though they had several employees and State Department guests at the conference, none spoke beyond the introductions and in my opinion, their influence was not felt in the programming. Make the conference more interactive. Allow “barcamp” style sessions for participants to break away in interest groups and learn from each other. Include youth activists in the speaker lineup. Palestinian activists have a rich history of using online tools; there are plenty that could share their knowledge. Provide basic training. Many participants admitted to not using Twitter–the most oft-discussed tool at the conference–while others lacked basic awareness of online safety measures. Responsible training could go a long way. *Full disclosure: I was invited and financially sponsored by the US Consulate of Jerusalem, but my talk was independently prepared and not at all influenced by my sponsor.